If the hassle of the Galeria is too much, there is a way to slow down and shop in style right in the heart of town. Escape the bustle by taking yourself to the Lulu Living Concept store on ul. św. Tomasza. As you approach the attractive gates the atmosphere begins to calm down, and walking into the courtyard is like stepping into another world. Not quite the same one as in years gone by, when this building was a notorious brothel. The shop is on the first floor and going inside is like stepping into a fine palace full of beautiful things to enhance your home. 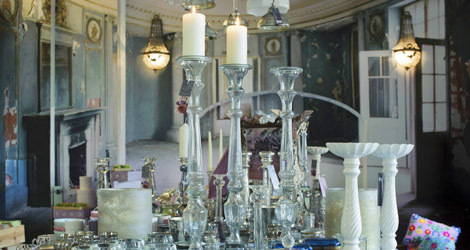 The wares on offer include pieces of vintage furniture such as decked drinks trolleys, lamps, shades, dramatic chandeliers and sofas. This is a place where you can take your time choosing a piece that will lift your room, from the ordinary to the extraordinary. My eye was caught by the unusual candles, especially the ones crafted into beautiful replicas of orchids – perfect for floating in a glass bowl as the centrepiece of a dinner table. There are also fun wax hyacinths and artichokes, good for brightening a kitchen. Some of the more modern designs can be found in the bright cushions piled onto couches and chairs. When you’re done, stay awhile, buy a coffee and browse through the design magazines. It’s a world to take into your home. ← Philharmonic Hall, Falling Down?